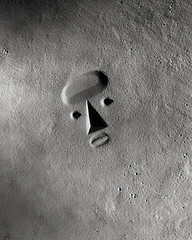 Noguchi -- To Be Viewed From Mars. Unrealized proposal for a massive earthwork sculpture where the length of the nose would be one mile. This project draws upon his earlier proposal of 1933, Monument to the Plough, that featured a triangular pyramid of earth. The message of this proposal seems more ominous and apocalyptic, suggesting that in a hypothetical future aliens from elsewhere in the solar system would have this visible feature on the earth's surface to indicate that at one time the planet was inhabited by humans. The triangular pyramid for the nose and cones for the eyes are relatively self-explanatory if rigid and mechanical. The flattened oval above the eyes and nose is rather odd, perhaps suggesting the developed, but limited thinking mind or brain. The oval of the mouth with an opening suggesting parted lips suggests that this marker is attempting to speak or communicate. The two oval forms are clearly related and of the same geometrical origin. This association between the mind and the mouth connects them and possibly indicates that thought and expressions of thought through language were an important characteristic of this ancient, extinct race. For various personal reasons, Noguchi felt himself to be an alien from his own world. Following the devastation, inhumanity, and destruction brought about by mankind's advances in technology, Noguchi seems to wish to bring attention a viewpoint outside our world to bring attention to the potential apocalypse we had brought upon ourselves. Perhaps if this work had been realized it could stand as a monumental reminder for humans to consider an earth devoid of life, barren and empty.